Latest report notes constant supply of industrial park space in Vietnam's south during second half of last year. 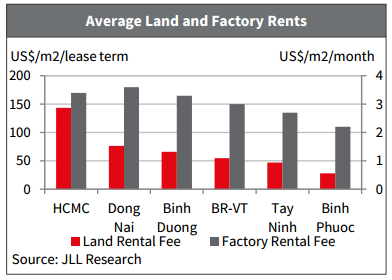 Southern Vietnam’s real estate market witnessed a relatively constant supply of industrial parks in the second half of 2017 compared to the first half, with a total leasable land area of about 24,000 ha, according to the latest report from JLL Vietnam. Of the total, Binh Duong and Dong Nai provinces remained the leading markets, accounting for nearly 60 per cent, given their better accessibility to transportation infrastructure. The vacancy rate at operating IPs stood at approximately 25 per cent as at the end of 2017, down 180 basis points from the same period of 2016 and driven by healthy demand. Healthy performance was observed in existing ready-built factories, which recorded more than 85 per cent occupancy rates due to strong demand and limited leasable stock. As at the fourth quarter of 2017, land rentals in the Southern Key Economic Zone averaged $72 per sq m per lease term, representing an increase of 3.3 per cent year-on-year. 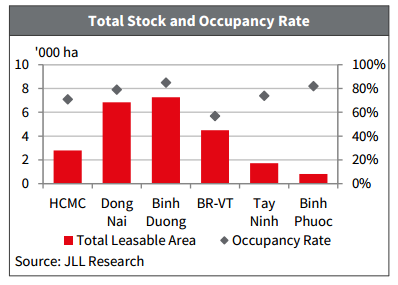 By location, rentals in Ho Chi Minh City have long held the lead in the south, at nearly double the regional average. Net land rentals in other southern cities saw an upward trend, within the range of $3 to $5 per sq m for the lease period. Factory rentals were relatively unchanged compared to previous quarters, at between $2 and $5 per sq m per month. The report also noted that more than 1,300 ha of supply now in the pipeline is expected to enter the southern market over the next year, mostly from expansions at existing projects. 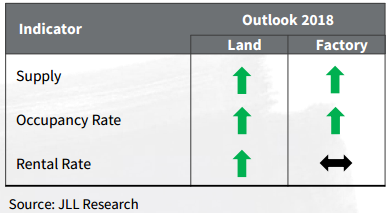 Occupancy and rental growth rates are both expected to go higher due to active occupier demand and positive economic prospects. Demand for good quality, ready-built space and related services at industrial parks will likely increase strongly.